OP3235. CARMEN, Live Performance, 9 Jan., 1937, w.Gennaro Papi Cond. 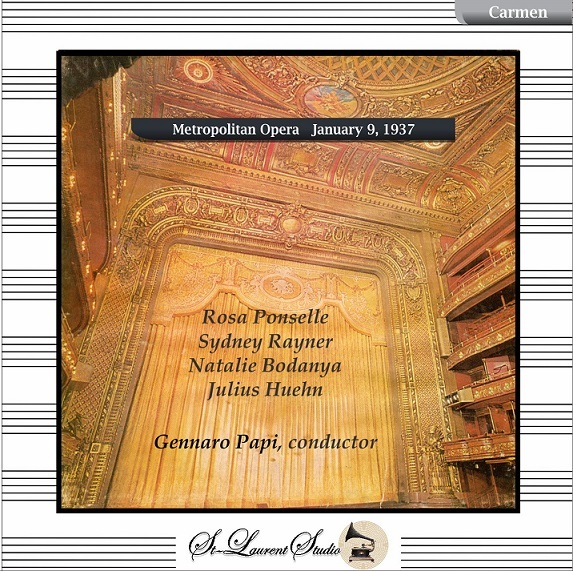 Met Opera Ensemble; Rosa Ponselle, Sydney Rayner, Natalie Bodanya, Julius Huehn, Thelma Votipka, Helen Olheim, Giordano Paltrinieri, George Cehanovsky, Louis D'Angelo & Wilfred Engelman. (Canada) 2-St Laurent Studio YSL T-649. Transfers by Yves St Laurent. "Carmen was the last role taken on by Rosa Ponselle in her two-decade Met career. Her portrayal was very controversial at the time and has remained so. Olin Downes, chief music critic at the New York Times, savaged her, which reportedly hurt the singer deeply. He began, 'We have never heard Miss Ponselle sing so badly, and we have seldom seen the part enacted in such an artificial and generally unconvincing manner'. The review did not go uphill after that. Audiences, on the other hand, loved Ponselle's Carmen at the time, and music lovers and critics have been split ever since. In Fanfare 3:6 I reviewed the Met's own reissue of Ponselle's final appearance with the company, on tour in Cleveland on April 17, 1937. Although I thought the overall performance suffered from end-of-the-tour fatigue, I was extremely positive about her. Back in the house she is heard to much better advantage, and there is no question that this is the Ponselle Carmen to own, especially in St. Laurent Studio's superb transfer. (One defect is an obvious scratch on the source material for just a brief moment in the final scene, but it goes away quickly). For those readers who love detail, here is the history of Ponselle's Carmen performances at the Met. I reproduce it here in part to show how much experience she had with the role, and how many opportunities she had to make subtle adjustments in her portrayal by the time of this 1937 broadcast. All performances listed below took place at the Metropolitan Opera House unless otherwise specified. Thus, the performance under review is the 12th of 15, three of which have survived in recorded form (Feb. 1, 1936, Jan. 1, 1937, and Apr. 17, 1937). After the Cleveland performance Ponselle did not officially retire. She simply never returned, in part because of her anger that General Manager Edward Johnson would not stage ADRIANA LECOUVREUR for her (similar to the battle Tebaldi had with Rudolf Bing over the same opera, although he eventually relented). It is, of course, possible that between the opening night reviewed by Downes and the 12th performance a year later Ponselle refined her interpretation and grew more comfortable in the role. I hear no hints of any of the issues that he (and other critics) raised. To be sure, if your view of CARMEN is that it must be performed in a restrained, delicate, so-called French style, this performance in the grand manner may not be for you. Ponselle throws herself into the music and the drama without restraint. As I said in my 1980 review, 'She bellows in anger, whispers and croons seductively'. (A vivid sample can be viewed on a YouTube video of Ponselle singing and dancing the 'Seguidilla' and 'Habanera' that is quite unforgettable.) Her Carmen is, to these ears, convincing, gripping, and gorgeously sung. The voice was still in superb condition in 1937 (she was a few weeks shy of her 40th birthday), producing an even column of sound from top to bottom. Her low notes were, perhaps, richer than those of any other singer not identified as a mezzo or contralto, and there were no audible register shifts. Additionally, there is a grandeur and richness to the tone that immediately stamps it as a voice you must engage with as a listener. Ponselle could (and often does here) sing softly with delicacy and a seductive quality. She could also overwhelm with raw power. She was a force of nature, and that is surely not inappropriate for the character of Carmen. Even if there are other ways to sing this music, you will be very much poorer if you haven't heard her performance. The long-lived American tenor Sydney Rayner (1895 - 1981), born in New Orleans, has the style down for Don José. He sings with dramatic engagement (he is particularly effective in the final scene), but there is nothing memorable about the voice itself. Rayner brings a good sense of line to the role, and the voice is steady in tonal emission. It is just not a sound that impresses itself on the ear, and one comes away remembering Ponselle far more. René Maison and Charles Kullman were her principal partners in most of her Carmen performances, both displaying more tonal glamour. (What a shame there is no recording of the first performance, the only one she sang with Giovanni Martinelli.) I want to emphasize that Rayner is not a distraction in any way and, as one listens to him, one can admire the secure firmness of his singing. Natalie Bodanya was also American and also lived a very long life (1908-2007). She sang a wide range of lyric soprano roles at the Met from 1937 through 1942 and had a European career as opera singer and recitalist. To her credit, Bodanya cancelled contracts in 1938 with La Scala and the Vienna State Opera to protest the anti-Semitic measures being propagated in Italy and Austria. She is a more than adequate Micaela, although as with Rayner there is little glamour to the voice. She does sing the act III aria well and is persuasive in her scenes pleading with Don José. Julius Huehn (yet another American) is perhaps at an unfair disadvantage because we know he replaced Ezio Pinza as Escamillo, and he simply cannot compare. Huehn fails to bring the requisite swagger to a role where we really do want to hear a ringing bravado. His Germanic training (he was most at home in Wagner during the 1930s and 40s at the Met) did not really prepare Huehn to be a convincing toreador. The rest of the cast is more than adequate, particularly Thelma Votipka as Frasquita and Helen Olheim as Mercédés. Conductor Gennaro Papi is much better here than in the Cleveland tour performance issued by the Met, which is marred by cuts as well as rushed tempi. Perhaps everyone was ready for the tour to end so they could get back home. Whatever the reason, the present account is almost 10 minutes longer under the same baton. A few cuts remain (for example, Carmen's interjections of 'L'amour' at the end of the Toreador's Song are missing), but many are restored. Papi's conducting is rather generalized yet decently paced. Those who are familiar with the typical sound on 1930s broadcasts are likely to be surprised by how listenable this set is. In its quiet way St. Laurent Studio is beginning to establish a reputation as one of the best boutique labels doing restoration work of historical material. The present release, like all their previous efforts, is available at Norbeck, Peters & Ford (www.norpete.com). This is surely the finest of the three recordings of Ponselle singing Carmen to survive. The 1936 broadcast from the Met suffers from very cramped, congested sound, and I described the problems of the 1937 Cleveland tour performance earlier. In sum, here is a performance of monumental importance. Ponselle's studio recordings rarely represent her at her best. RCA's dry, closely miked sound and the lack of inspiration from a live performance make those studio efforts a poor substitute for the real thing. 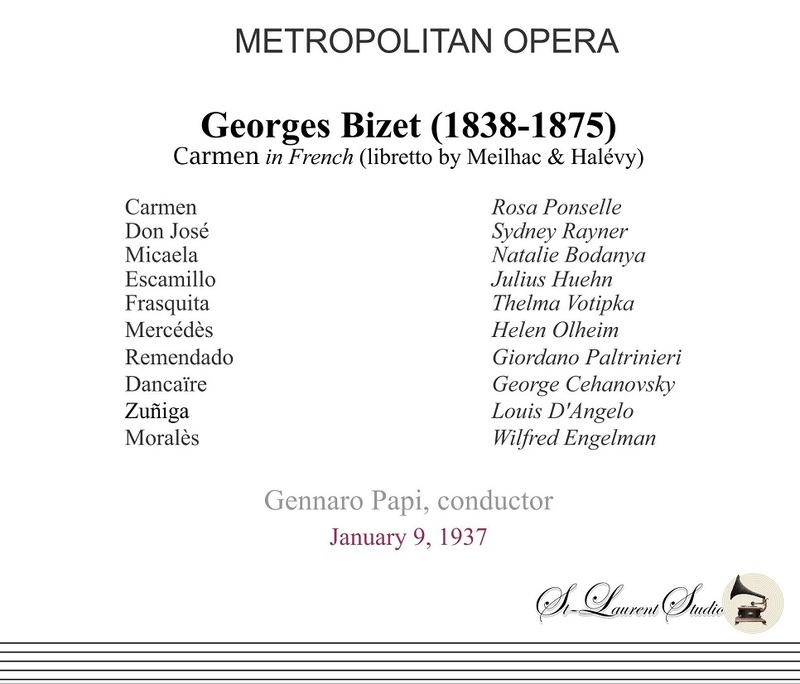 Fortunately, the real thing is available in this CARMEN as well as in a Met TRAVIATA from the same period. They are thrilling as only a great operatic performance can be." "There are some things about a live operatic performance that a studio-made recording just can't duplicate. All the possibilities - inspiration, subtlety, revelation of a composer's work, seizure of a great moment, athleticism with its risk of disaster, simple music-making - are in play before an audience of flesh and blood, in one particular moment. The stakes are high and immediate." 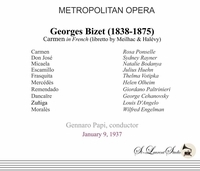 "A native of Naples, Papi came to the United States in 1913, becoming Arturo Toscanini's assistant on the conducting staff of the Metropolitan Opera. When Toscanini left the company during the 1914-15 season, Papi became principal conductor, making his debut in that position on November 16, 1916 with Puccini's MANON LESCAUT. San Francisco critic Alexander Fried ran into Papi in the lobby and said: 'You know, maestro, I admire your conducting very much, but you haven't lost that habit of hissing at the orchestra. You'd be surprised how one can hear it even over the trombones'. 'All right', said Papi, without losing a beat, 'the nexa time I putta potato in my mouth'."